Hot dresses like these can be found for under $5 at many thrift shops! Selling used clothing is an excellent way to make money. Best of all, we all have a continuous supply of used clothes to sell, especially if we have children! Garage sale clothes and thrift store clothes can also be sold on eBay and Etsy for excellent profits. You will see some idea about what to look for and how to sell used clothes online. How do you decide if you want to buy clothes? Put yourself in the shoes of the people that you are trying to sell your used clothing items to. Buy used clothes that are visually appealing, and translate that into your auction listings. Take multiple photos of the parts of the clothes that make them stand out. Make sure that your photo looks cool in a small thumbnail photo, as the thumbnail is all people are going to see before deciding whether to click on your auction from the search results. RESEARCH is key! You will see this theme throughout this webpage. Look through eBay Completed listings often and see what has been selling well recently. Look at how other sellers effectively describe their items and present articles of clothing. 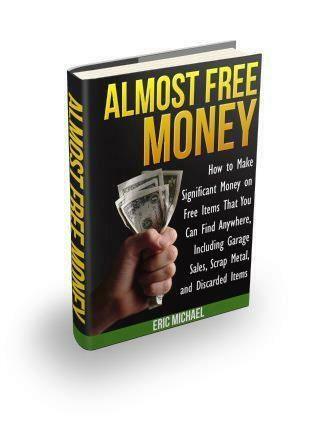 Time spent researching will come back to you in profits five-fold! Learn how to effectively photograph used clothing, so that the items look professional and appealing to prospective bidders. If you are going to sell more than just the occasional item of used clothing, set yourself up with an area to photograph in. Have a colorful backdrop to make your photos POP. Clothes look better when people are wearing them. Consider having a mannequin to put your clothes on, or have somebody wear them for photos. Make your clothes look good! Take several pics of each item. When selling used clothing, it is very important to accurately describe condition. If the clothing has EVER been worn, it NOT NEW. Never describe clothing as new, unless it is still fresh from the racks, with tags. Make sure that you note ANY defects to condition: light stains, holes, stretch marks, frayed edges, etc. Again, put yourself in the buyer’s shoes. Would you want to get an item that has issues that were not visible in the auction photos, and not described? I thought not. Prepare your clothes. Wash the clothes, and iron them. If you have the know-how, sew small seam splits, etc. Make used clothing look as presentable as you can for your auctions. Garage sales and yard sales vary greatly in how used clothes are priced. You can visit some sales and get great prices on used clothes that should be priced much higher. 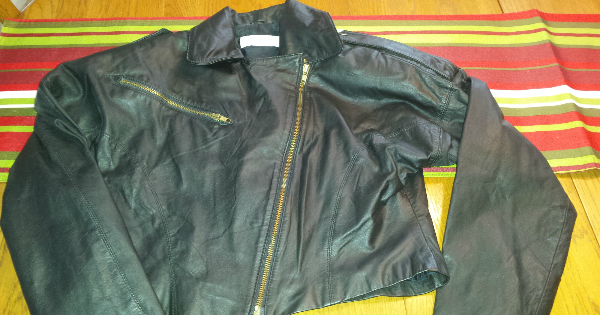 I have seen many vintage leather jackets and other vintage leather items priced at $5 and even cheaper at garage sales.Conversely, I have been to yard sales where T-Shirts and stained shorts were priced at $3, and jackets costed $20. Don’t be too quick to spend money at garage sales. 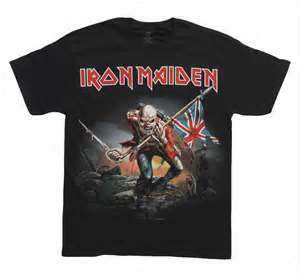 Vintage Rock T-Shirts can be found for $1 at Yard Sales and sell for over $100 on eBay! Make sure that you find a good garage sale, where you can buy items at low prices. Learn how to barter with people. You can often get prices reduced, or bundle a bunch of items into one lower price.Unlike thrift stores, used clothing at garage sales have not been checked over to see if they have holes, stains, etc. You have to check them closely for condition issues. When selling used clothing, it is important to find items that people want to buy, but it is also important to ensure that the condition is good enough so that clothes don’t get returned, or result in negative feedback to your eBay account. Thrift Stores are great because most thrift store clothes are not individually priced. That means there ARE going to be bargains galore, including clothes to sell on eBay. Clothes are priced to move inventory. They are not priced for profit margin. The employees that price the clothes do not have emotional attachments to used clothing, either. You just have to be there when the good articles get put on the racks. Try to get the clothes during the ‘50% off’ sticker days. Many thrift stores have colored price stickers, and each week a new colored tag is 50% off. She looks TOO happy. Make sure you are not eating profits by buying lots of groovy clothes for yourself! Get to know thrift store employees and managers. You might get tips on when a bunch of high-end clothes are going to get put on the racks! Condition is very important when selling used clothing. Make sure zippers work, buttons are not missing, and accessories are there. Items with tags are also worth more. Research, research, research. Know what used clothes to buy, and which brands are worth the most. 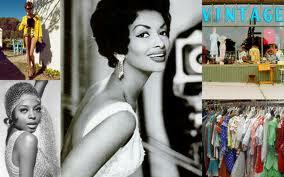 You can also find some really cool vintage T-Shirts and vintage suits and dresses at Thrifts. They always do well when selling used clothing on eBay. Almost every style of clothing that has ever been popular makes a comeback at some point. Vintage clothing can be very collectible and profitable. Look at what famous people are wearing. That’s right, vintage clothing is very popular with movie stars and many rock and roll and pop stars wear vintage clothing when on stage. Take notice of the outfits they wear, so you can buy them when you see them at garage sales and thrift stores. I remember seeing Stone Temple Pilots in concert in the late 1990’s, and seeing the lead singer wearing a cool velvet leisure suit. I saw one almost exactly like it at a thrift store several moths later for $3 and sold it for $80 on eBay. Everything comes back eventually. 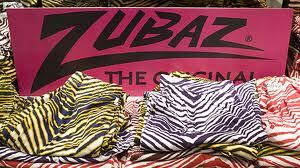 Even these Zubaz pants have come back and originals can sell for $25-50 on eBay. Vintage clothing is one niche that is going to grow as people get bored with current trends. 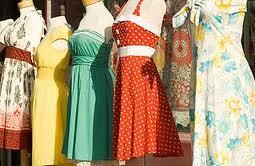 Vintage clothing is original and hard to come by, making it collectible and worth money. I’m surprised that there aren’t more people specializing in this niche. Search, search, search on eBay Completed Listings in the Vintage Clothing categories. You CAN find this stuff at garage sales and thrifts. You just need to research what sells at any given time. Know what brands are popular, and what styles people are looking for. I am not going to list particular styles, because they change continually. Look at what is popular and look for those styles. You can make a surprisingly good profit on vintage clothing accessories like sunglasses from 1990’s and before, vintage hats, canes, charm bracelets, and purses. garment, and give them a good background. If this is going to be your “gig”, find a model to wear your clothes for photos, or you may opt to use a mannequin. At the least, iron your clothes and hang them from a hanger or lay flat. MAKE YOUR CLOTHES LOOK GOOD. Give good item descriptions. Note any defects. DO NOT RISK NEGATIVE FEEDBACK TO MAKE A COUPLE BUCKS. Vintage Blue Jeans and vintage jean jackets can be worth a lot of money, and they don’t even have to be that old. Start researching on eBay Completed listings. Old Levi’s vintage jeans can be worth thousands of dollars. In the last several months, a pair of 1941 Levis 501’s sold for $6000 and another pair sold for $4500. Look for the single stitching and Red line selvege. There are many examples of these jeans selling for thousands of dollars. Vintage Levi 501 Jeans are Highly Sought After by Collectors. Redline Selvages Were Used Until 1982. Redline 501 Blues can sell for up to $10,000. There are many collectors of vintage denim. The easiest way to ID vintage used jeans is to look at the selvage. Click on the hyperlink for an excellent webpage on what a selvage is and where to check them on vintage blue jeans. The trademark Levi’s red line selvage was copied by many companies, but all of the stitching will not be red. Vintage jeans are in high demand, especially in Asia. Make sure that you ship internationally when selling vintage jeans. 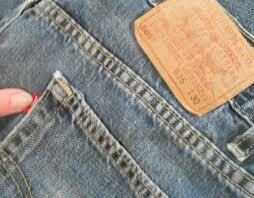 Vintage jean jackets are also highly collectible, especially the pre-1970’s Levis blue jean jackets. There are modern knock-offs that imitate the vintage selvage stitching. People like broken-in jeans, but stains and smoking odors are a big turn-off. Wash and iron jeans before photographing and listing. Provide multiple photos and good descriptions of the style of jeans. Give measurements in inches, not just the sizes on the tags – many countries have different measuring methods. Learn about selling used clothing online for great money. 12 year selling veterans reveal how to find the best selling clothes at thrift stores, yard sales and sell on eBay and Etsy for quick cash.